How do I keep my concrete driveway looking like new? In my eyes, a freshly poured concrete driveway is a thing of beauty. The trick is to keep it looking that way. Once your new concrete driveway has finished curing, it’s ready to be cleaned and sealed. Because properly cleaning and sealing a concrete driveway is the only way to ensure it stays looking like new for many years to come. But use caution before trying to do the job yourself. Power washing and finishing with a box store sealer aren’t enough. After a thorough, professional cleaning, a high-quality sealer needs to be applied. Only commercial-grade sealants have the right formulation to withstand the rigors of our Northeast Ohio weather changes. A quality sealant closes the capillaries in the concrete, which prevents decay, dirt and debris from damaging the surface. And it’s never too late to introduce new tricks to old concrete. Have a professional concrete company inspect your older concrete driveway prior to cleaning and sealing it. In addition to using the best practices for cleaning and sealing concrete, a professional concrete company can inspect it for surface damage and cracking and address those problems on the spot. Because our specialty is concrete, we can do more than a power washing company can do. Whether your home was built in 1967 or 2017, we have the best products and the best remedies to keep your concrete driveway looking like new. 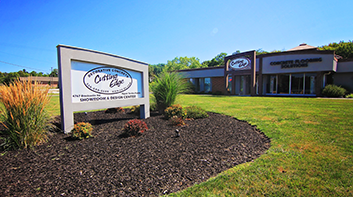 Cutting Edge Decorative Concrete is located at 4767 Brecksville Road in Richfield. The phone number is 330-659-6686. For project ideas and inspiration, visit MyConcreteFloor.com. Showroom hours are Monday-Friday, 9 a.m.-4 p.m.; and Saturday and evenings by appointment. Find them on Facebook at Cutting Edge Decorative Concrete.